It’s the last month of the year already?!? Hard to believe, I know, if you’ve done a good job of ignoring all the red, gold and green covering malls everywhere (with apologies to the Culture Club). The march to the holiday season brings not only mass consumerism gone mad, but a chance to forget your troubles at the local multiplex with a movie or two. To help make your December more cinematically awesome, here are 5 films to see at the box office this month. 5) The Adventures of Tintin (December 9) – Any time you get names like Steven Spielberg (ET), Peter Jackson (The Lord of the Rings trilogy), Edgar Wright (Shaun of the Dead), Steven Moffat (Doctor Who), Joe Cornish (Attack the Block), Andy Serkis (The Lord of the Rings, King Kong), and Nick Frost & Simon Pegg (Hot Fuzz, Paul) involved in the same project, you can’t help but take notice. 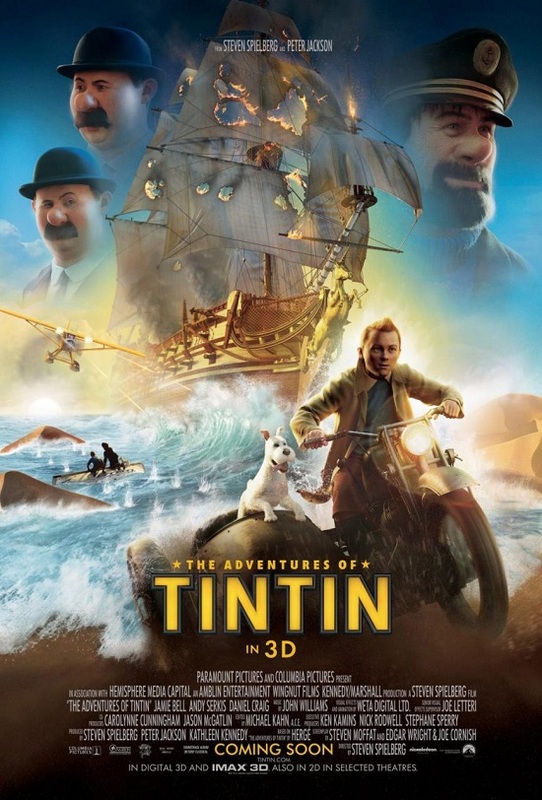 Combining three of the classic comic books by Belgian artist Hergé, this Spielberg-directed & Jackson-produced motion-capture film follows the adventures of the titular young detective (Jamie Bell) as he finds himself the unwitting owner of a treasure map sought by dark and mysterious men. While the source material is now almost laughably racist in some parts, expect a smarter-than-normal family feature worth seeing with the kids. With the talent involved, it’d be silly to miss out. 4) The Iron Lady (Limited, December 16) – If there’s a movie that requires a woman over 50, Hollywood usually defaults to just one choice: Meryl Streep. The fact remains true in this potentially controversial take on the life of former British Prime Minister Margaret Thatcher. 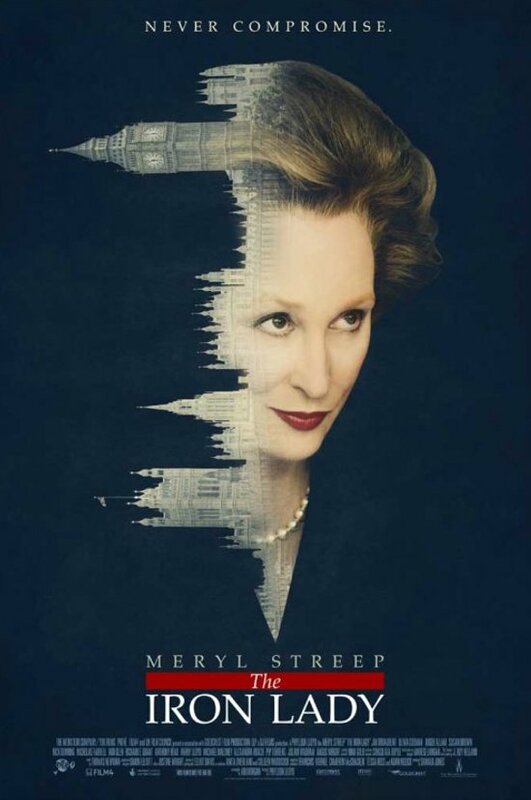 Reviews have been mixed in early screenings, so it looks like a biographical take on Britain’s answer to 1980s conservatism will be as argued over as the legacy of the Iron Lady herself. The only consistent praise comes from the Streep factor, including word that she could be up for many awards come the new year for her take on Maggie. See it sooner rather than later, or you’ll be fighting the crowds come the new year if the Oscar buzz turns out to be true. 3) Mission Impossible: Ghost Protocol (December 21) – America’s favourite Scientologist puts down the Thetan meter long enough to once more take on the role of Ethan Hunt in the fourth entry of the film franchise, produced by J.J. Abrams and directed by Brad Bird. 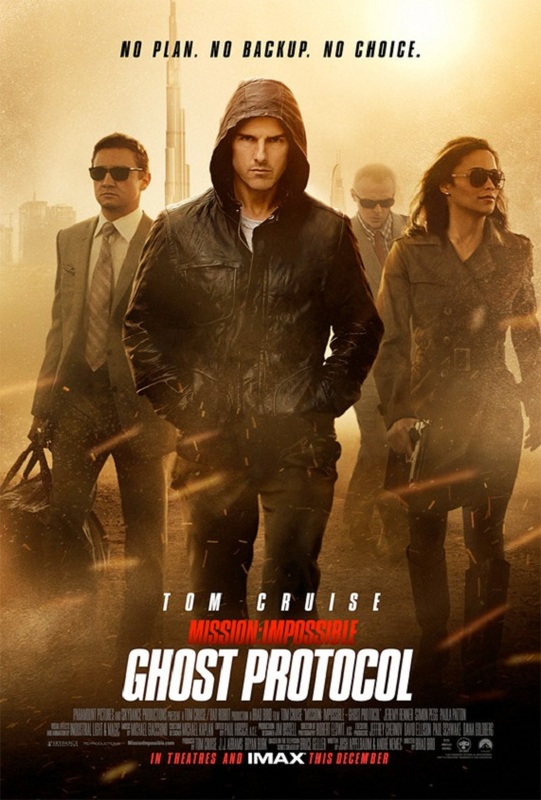 This time around, Tom Cruise brings along Jeremy Renner, Simon Pegg, Ving Rhames and Paula Patton as members of his IMF team after the Kremlin is destroyed in a terrorist bombing and the Impossible Mission Force is to blame. After the IMF force is disavowed by the American government, it’s up to Hunt and his team to figure out what really happened and catch the people responsible. Easily the most action-oriented film of the month, at least 30 minutes of the movie will be made up of footage shot using IMAX technology, so if you can see it in the appropriate theatre, do so. 2) The Girl with the Dragon Tattoo (December 21) – Even though the Swedes adapted Stieg Larrson’s Millennium trilogy a couple of years ago, it was only a matter of time until Hollywood came calling after selling over 27 million books in over 40 countries. Daniel Craig (the most recent James Bond) stars as reporter Mikael Blomkvist, disgraced after losing a libel case against a shady billionaire. Invited to write the history of the Vanger family in exchange for evidence that would clear his name, he realizes that freelance hacker Lisbeth Salandar(Rooney Mara) is keeping tabs on him as he gets swept up in the mystery of the 35 year-old murder of Harriet Vanger. Directed by David Fincher with a soundtrack by Trent Reznor and Atticus Ross of Nine Inch Nails, this is the big film with bite this holiday season – just don’t get angry if everything doesn’t happen like it does in the book. 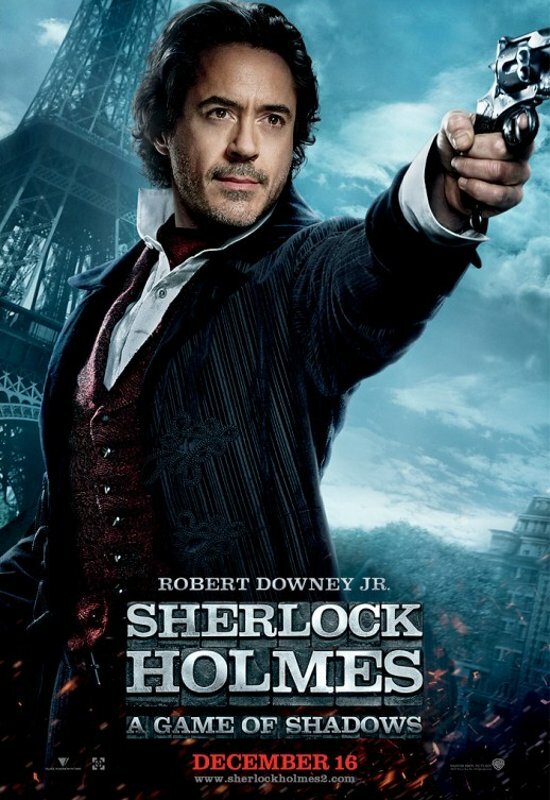 1) Sherlock Holmes: A Game of Shadows (December 16)– The frenetic direction of Guy Ritchie combined with the talents of Robert Downey Jr., Jude Law and Rachel McAdams made 2009’s Sherlock Holmes a holiday, and the same should be expected of its follow-up. This time out, Sherlock Holmes faces his nemesis, Professor James Moriarty (Jared Harris) following the suspicious death of the Crown Prince of Austria. McAdams is gone to make room for the original Lisbeth Salander from the Swedish Girl with the Dragon Tattoo film, Noomi Rapace. as a gyspy fortune teller. Expecting storytelling faithful to Sir Arthur Conan Doyle’s source material or an accurate depiction of physics in human movement? Don’t. This is popcorn entertainment through and through, so enjoy it as such. What to avoid? New Year’s Eve on December 9th and Alvin & The Chipmunks: Chipwrecked, out December 16th. What’s on your must-see list this December? My must-see list? Most of what you have here but include: Tinker, Tailor, Soldier, Spy with it’s amazing ensemble cast and, of course, the HIGHLY anticipated 6-minute prologue to Christopher Nolan’s upcoming The Dark Knight Rises, shown in front of MI: Ghost Protocol at select IMAX theatres only. That’s gonna be killer!